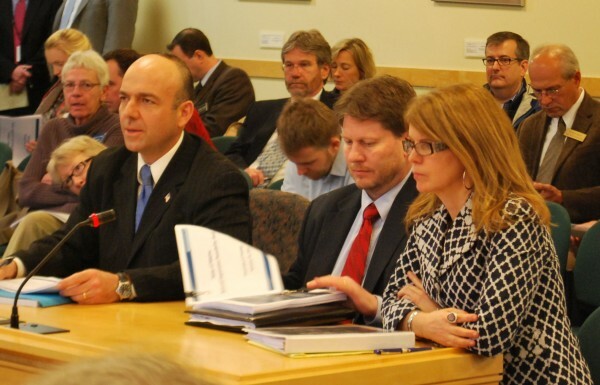 Gary Alexander (from left) and Eric Randolph of Rhode Island-based Alexander Group and Maine Department of Health and Human Services Commissioner Mary Mayhew prepare Tuesday to answer questions from the Health and Human Services Committee in Augusta. As lawmakers have debated whether Maine should extend Medicaid to about 75,000 low-income adults, they’ve done it without the aid of a comprehensive, Maine-specific analysis of the expansion’s costs and benefits. That was supposed to change this week as Gary Alexander delivered his Medicaid expansion feasibility study to the Legislature. Alexander, a former human services chief for Republican governors in Rhode Island and Pennsylvania, is the consultant chosen by Gov. Paul LePage’s administration to examine Maine’s Medicaid and welfare programs and recommend money-saving reforms. But as Stan Dorn read through Alexander’s Medicaid expansion analysis, “the biggest thing that jumped out at me about this report was how incomplete it was,” he said. Dorn is a senior fellow at the Urban Institute’s Health Policy Center in Washington, D.C. He’s one of four authors of a widely cited, state-by-state analysis of Medicaid expansion’s financial implications performed for the Kaiser Family Foundation. Dorn has also closely followed how states have weighed their options when it comes to expanding Medicaid. Last year, Dorn and three others from the Urban Institute published an overview of how 10 states approached the Medicaid expansion question. Six of those states, Dorn said, did comprehensive analyses to determine costs and benefits. Those analyses all considered four broad budget areas on which Medicaid expansion would have an impact. Alexander’s analysis considered just one — the cost of expanding the low-income health coverage program. Alexander’s analysis concluded Maine would rack up $807 million in additional costs over the next decade from expanding coverage beyond current levels. The Urban Institute’s analysis — which applied a national simulation model to each state — concluded expansion would save Maine $570 million in state funds in that time based on what the state spent in the fiscal year that ended June 30, 2013. That approach left Alexander considering only the impact of new enrollment in MaineCare, the state’s Medicaid program. Expansion-related savings for non-Medicaid programs. States determined that, after expanding, they could start billing Medicaid for some services currently covered exclusively with state funds. For example, Maine’s current two-year budget sets aside $61 million in state money to cover mental health community services, which draw down about $22 million in federal funds. With expanded Medicaid eligibility, it’s likely many of the adults receiving exclusively state-funded services would qualify for Medicaid, thus shifting all of their costs to the federal government in the short term and 90 percent long-term. The same goes, Dorn said, for substance abuse treatment — for which Maine’s current budget sets aside $20.3 million and draws down only $3.6 million from the feds. In addition, Medicaid would start to cover medical services provided off prison grounds for inmates who become newly Medicaid-eligible. The Department of Corrections set aside nearly $39 million for its medical services fund in the current two-year budget. With expansion, it’s likely the department could receive more than the current $1 million federal match it’s anticipating. Alexander suggested Maine could, without expanding Medicaid, petition the federal government to reimburse the state for some of those services. That reimbursement, however, would be at the federal government’s standard 61.55 percent matching rate rather than the higher matching rates (100 percent in the short term, then 90 percent long-term) offered through Medicaid expansion. Some states even concluded they would see savings in their state employee health insurance programs since, post-expansion, health care providers would have fewer uninsured patients whose costs they would need to shift to private insurance plans. Expansion-related savings for existing Medicaid recipients. The state currently receives 61.55 percent reimbursement for those served by MaineCare’s “medically needy” program, which allows those whose incomes are generally too high to qualify for Medicaid once their medical bills reach a certain point. About 500 Maine adults with especially high medical bills qualified for this service in 2009, according to the Kaiser Family Foundation. Under expansion, some would likely become newly eligible for Medicaid, and Maine would start collecting 100 percent federal reimbursement for them in the short term and 90 percent long-term. Maine could experience the same gain for some women in a Medicaid program that covers breast and cervical cancer treatments. Expansion-related tax revenues in state coffers. Alexander’s analysis determined an economic impact statement to be beyond its scope. However, expanding Medicaid is “the equivalent of bringing a military base to your state,” Dorn said. Those revenues are direct and indirect, he said. For example, Maine assesses an annual 2.23 percent tax on hospital revenues. With thousands more people able to pay for hospital care through Medicaid, hospital revenues would rise (the Urban Institute predicts Maine hospitals would see $348 million in additional revenue due to the expansion over the next decade), and the state would receive more tax dollars from them. Then, there’s the impact of about $3.5 billion in federal funds over a decade flowing into Maine’s economy, according to the Urban Institute. What would it cost? What would it save? Those questions remain as the Medicaid expansion debate unfolds this winter. On the cost questions, the Alexander report has come under scrutiny for a number of assumptions, including its projections that the number of Maine people in poverty will grow 31 percent over the next decade. “If he has a reason why the poverty rate is going to go up even as the economy recovers, he needs to talk about that,” said Charlie Colgan, a former state economist and a professor of public policy and management at the University of Southern Maine’s Muskie School of Public Service. Randolph said the group used U.S. Census poverty figures from the periods immediately preceding the last two recessions to establish a trend. Then, an actuary adjusted for mortality. While Maine’s projected population growth is minimal, “the growth in the population is in those areas where people are in poverty or close to poverty,” Randolph said.